Hotlanta sets your feet on Bourbon Street in Old New Orleans. You'll experience every bit of the joy, energy, and humor of that early American Jazz now called Dixieland. Based in Atlanta, this group has performed extensively throughout the United States, Europe, and Asia since its founding by Don Erdman in 1990. The South, however, is home to this band where their music has been enjoyed at festivals, colleges, concert halls and jazz clubs. 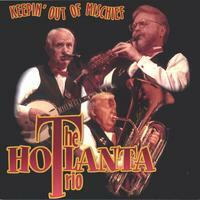 "Hotlanta's Keepin' Out Of Mischief CD is swingy, engaging and thoroughly delightful. Two words: Heart & Charm." "This is one of the best traditional jazz trios I have heard in recent times." "Keepin' Out Of Mischief features Bill Rutan's unique vocal style and superb playing abilities, Don Erdman's exceptional clarinet tone and technique, and Hal Johnson on backup. Each player a superb soloist on this delightful CD." try this one......if you like great dixieland jazz !!! these guys are really good !! hard to believe only three guys deliver such great dixieland jazz. go ahead......just try to keep those toes from tappin' !! betcha can't ! !